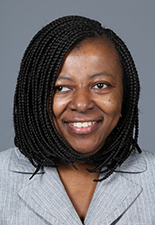 Floria Abney joined ABFE in October 2006. In her role as Administrative Associate, she provides general office support to the President and staff and assists with day to day operations. Prior to joining ABFE, she was Administrative Assistant to the Chief Operating Officer and The Director of Finance at The After -School Corporation (TASC). Ms. Abney has also served as an Administrative Assistant at Local Initiatives Support Corporation (LISC). With a life-long love of reading, she is a “self-proclaimed” book worm. She also enjoys cooking and traveling.